As promised, here is the giveaway for May 2016. Because it began late by a week, this giveaway will run for an extra week and close only on June 16, 2016. Open worldwide. Two prizes. Rules, entry form and other deets about prizes are further below. 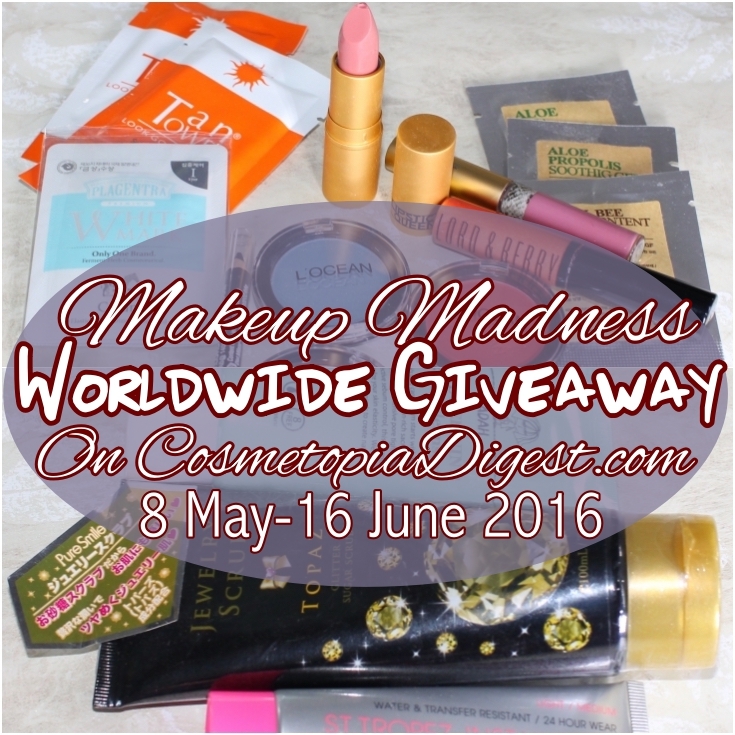 Scroll down to enter the May Makeup Madness International Beauty Giveaway. The first prize includes six full-sized makeup products and some samples. The second prize has four bath and body/skin products. The giveaway ends on 16 June 2016. I will announce the winners once I verify the entries (which could take a week or more, depending on my schedule in June and the number of entries). If I do not hear back in 48 hours, I will choose another winner. If the post office tells me I cannot ship liquids/something among these, I will replace them with other products. I am not responsible for duties, surcharges and other taxes or if the product is damaged or lost in the post. Nor do I agree to share in seven years' bad luck if the compact mirror in the first prize breaks in transit. Enter using the Gleam widget below. If you cannot see it, go here.